I am vindicated!! Ha, Ha, and HA! And F**k you to: All you naysayers and all who have looked down their noses at D&D players – it is as if I rolled an 18!!!! Because guess what ******s Rick looooves D&D!! HA!! Being a huge Rick & Morty fan, I was skeptical in reading this comic. I completely expected the usual B.S. I have always endured being a D&D fan. However, I was pleasantly surprised to find that 1 of my all-time “heroes” (Rick) was also a huge fan of rolling the 20 sided dice! That’s right B**ches ^buuuuuuurp^ D&D is cool according to Rick!! Just take that in for a minute. Rick explains to his grandson that the reason he loves the game so much, is because of D&D’s infinite possibilities, which makes sense since Rick is all about infinite possibilities & infinite outcomes, it’s no wonder, he is a fan. 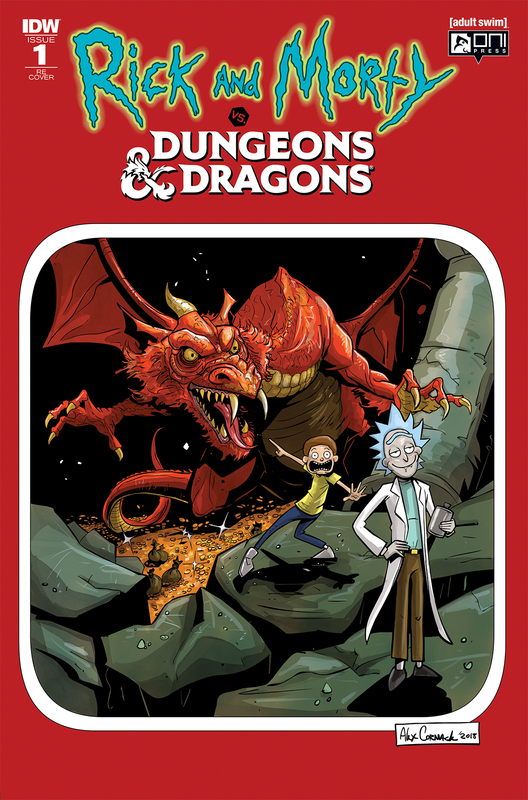 So, all of us – dice rollers and eye rollers – can sit back and enjoy this comic, be it a Rick & Morty fan, scratching for a fix until the new season comes out, or be it a die-hard D&D fan waiting for the next adventure…Drink it up B**ches (buuuuurp) and enjoy!!! I really, REALLY loved how the comic flip-flopped between color & black white, brilliant way to go between the moments!!! This is an excellent Directors Cut issue, and makes me want to read the rest of it now!